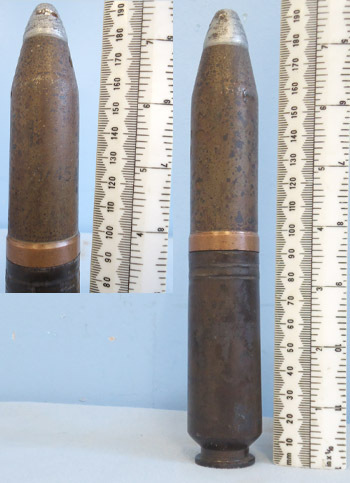 This is a rare experimental American WW2 .6” T17 anti-tank gun drill round developed for the American T17 anti-tank rifle that was experimented with but never adopted by the military. This brass cased round is headstamped F A 45 (Frankford Arsenal) (1945) and has three 5mm holes under the case shoulder. The primer pocket is drilled through. The steel projectile has a narrow copper driving band above the case crimp. Price includes UK delivery.